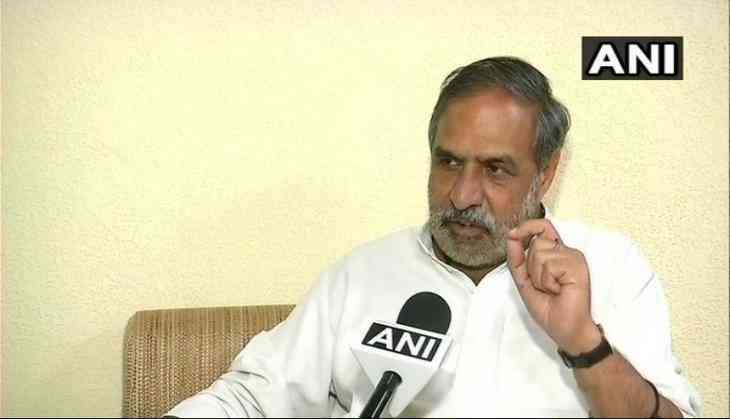 Senior Congress leader Anand Sharma on Thursday took a veiled jibe at the Rashtriya Swayamsevak Sangh (RSS), saying that former president Pranab Mukherjee had shown 'mirror' to the organisation, reminding them of what real India looked like. Speaking to ANI, Sharma said, "There was never any doubt of Pranab Mukherjee's ability to articulate and his conviction, but for dialogue, the other side must listen and change. Pranab ji espoused on a multi-lingual and multi-ethnic India, which is the beauty and strength of our country. He has shown mirror to RSS, whose ideology is completely the opposite, as to what is true India all about." "We did not see the tricolour go up or the national anthem being sung at the RSS head quarter. Hope, the RSS will reflect and change what should be changed," he added. Congress spokesperson Randeep Surjewala said that Mukherjee had shown the 'mirror of truth' of India's pluralism to the RSS. "Dr.Mukherjee's visit to the RSS headquarters (in Nagpur) had led to a wide range of discussions and concerns. Today, Pranab Mukherjee has shown the mirror to RSS. He talked of plurality, tolerance, and multiculturalism. He has reminded the RSS of the history of India. He taught the RSS that India's beauty lies in its tolerance for different ideas, religions and languages," Surjewala told media. Bombarding a series of questions to the RSS in regards to its Hindutva ideology, Surjewala asked, "Is RSS ready to admit its mistakes and ready to adapt India's pluralism, secularism and diversity? Will RSS give up its prejudice towards women and marginalised? Will it give up its inherent character of subjugation and violence?" Asked on Mukherjee's hailing of RSS founder K.B. Hedgewar as a 'great son of Mother India', Surjewala replied, "As a guest what Pranab Mukherjee ji said should be discussed and highlighted, not unwarranted formalities." Earlier in the day, Mukherjee spoke on the concepts of nation, nationalism and patriotism in the context of India, at the RSS event in Nagpur. Addressing the RSS cadres at the Tritiya Varsh Varg' event, the former president said, "We accept and respect our pluralism and celebrate our diversity. Our national identity has emerged after a long drawn process of confluence and assimilation, the multiple cultures and faiths make us special and tolerant. Nation is defined as a large group of people sharing the same language, heritage. Nationalism is defined as identification oneself with one's own nation. Patriotism is defined as devotion to one's own country. We derive our strength from tolerance. We respect our pluralism. We celebrate our diversity." "Intolerance will only dilute our national identity. Any attempt to define our nation through religion, dogma or intolerance will only fade our existence," he added. Mukherjee spoke about the ancient institutions of India that attracted students from outside as well. He said that the Indian nationalism emanated from universalism. The former president further said, "Any attempt at defining our nationhood in terms of dogma and identities or religion, region, hatred, and intolerance will only lead to dilution of our identity." The former president said the democracy is not a gift, but a sacred guide for the nation and its people.